I did a quick sketch last night, because it has been too long since I have done any artwork. I’m posting it here not because I’m pleased with the results, but because I need the motivation to get busy. 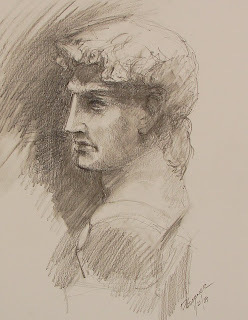 I bought this bust for the purpose of learning the Sight-Size approach to drawing. This was only a sketch. When I get the studio set up I will start that training. Here it almost finished. I worked on it about 8 hours Saturday and 2 hours Sunday. I painted it by building up thin layers. If you click on it you can see a large view. 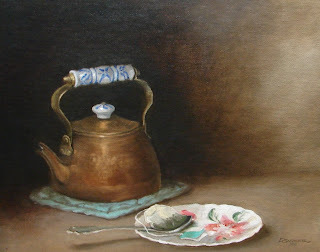 You will see that I painted the saucer, spoon and tea bag a little looser than the tea kettle. I was going to try a technique called glazing on this painting, but I think I will give it a coat of varnish and call it finished. I switched gears and got out the oil paints. 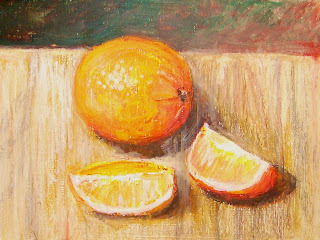 I have not painted in oils now for some time. I have been doing some work in graphite, and before that I was painting in watercolors. Here is the setup and the rough block in stage. 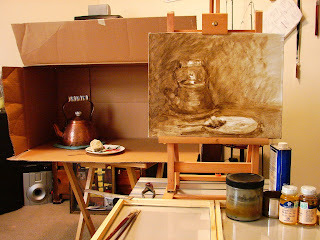 I use a brush to draw with burnt sienna adding some Dammar Varnish thinned with turpenoid. At this point I had about ½ hour painting time invested. First painting for 2009. Our house was in chaos most of the day with the taking down of the Christmas decorations. Not having a studio makes it hard to find a place to work. It was late when I set up this little still life, but I wanted to give the oil pastels another try. This time I used a 6"x 8" Masonite panel that was primed with gesso. I used a #4 filbert with some odorless Turpenoid to do some blending. I liked working on the panel because it has a smoother surface.